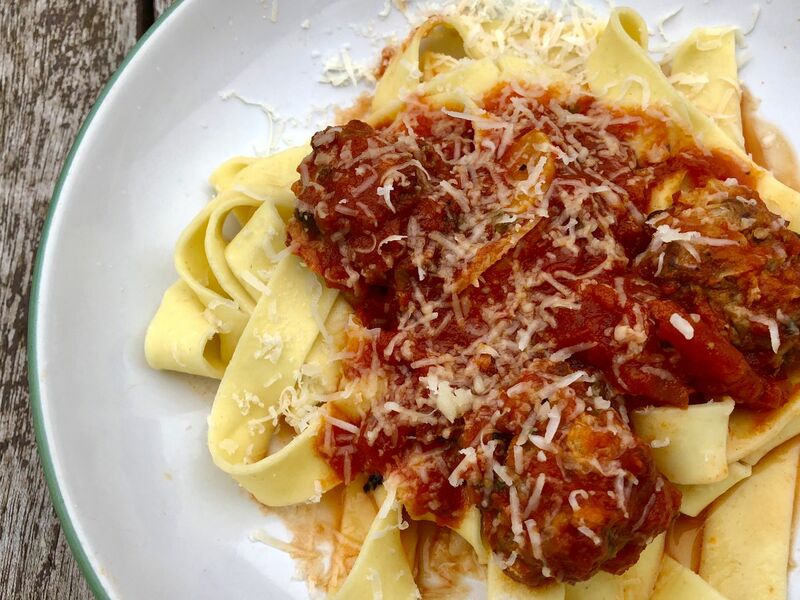 Wild game meatballs simmered in a simple red sauce over fresh pasta. There's a special section called "Sourdough Department" in the back of one of Anchorage's early cookbooks, "A Collection of Choice Recipes," which was compiled in 1921 by the Anchorage Women's Club. It was one of the first places I began to see wild game recipes creeping into urban Alaska's recipe box. Among my favorites: jellied moose nose, salted rabbit, caribou stew, bear roast. Even then, they knew the secret to cooking with wild game was paying attention to fat and salt. Bacon fat has always been a common ingredient. They braised meats frequently and often relied on the acid of tomatoes to tenderize. I feel lucky to live in a place where wild game — a delicious, lean, wild protein — is relatively easy to come by. But some of my cooking attempts have gone very wrong. (See: the crock pot moose roast that went Shrinky-Dink on me and was also tough as a tire.) But, these meatballs are THE BEST. The secret weapon, which some might say is cheating a little, is to add in some fatty Italian pork sausage. You can also use beef or ground pork and adjust the seasoning. My very favorite meats are venison and musk ox, but this recipe works just great with caribou and moose. I have not tried bear. Try it and let me know? Soaking the bread is an old Italian trick and it keeps the meatballs from being too dense. I like to make a double batch and throw half in the freezer. Later on a week night, I heat them in good jarred sauce or toss them with a quick cream sauce and some penne and bake it.